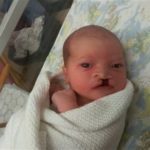 This section explains a bit more about the diagnosis of a child with a cleft and how this will affect things leading up to (or just after) their birth. What treatment will my baby need? Cleft lip and palate can occur separately or together. 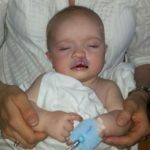 The causes of cleft are complicated, and they are usually the result of different factors coming together in a way that couldn’t be predicted or prevented. It is very unlikely that your baby’s cleft is because of anything you did or didn’t do during pregnancy. Read more about cleft lip and palate, how it happens, and how to find support after a diagnosis. Based on the most recent statistics compiled by CRANE, around 81% of cleft lips are diagnosed before birth, usually at the 20-week anomaly scan where parents can find out their baby’s gender. Cleft Lip and Palate: Most scans only ever pick up a cleft lip and sometimes a cleft gum (sometimes called a cleft alveolus, which is the bony bit of the gum). A regular ultrasound scan cannot reliably identify a cleft palate, either by itself or along with a cleft lip. If you have received a diagnosis of ‘cleft lip and palate’ from a regular ultrasound scan, it’s very likely that what was actually found was a cleft lip and gum. However, as around 60% of babies with a cleft lip will also have a cleft palate, expectant parents are often given a diagnosis of both. Only a very small number (1%) of cleft palates are actually diagnosed before birth. 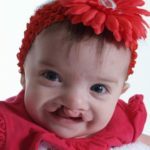 Bilateral and Unilateral Cleft Lip: Your baby’s cleft may have been described as ‘bilateral’ or ‘unilateral’. This is just whether or not the cleft affects one (unilateral) or two (bilateral) sides of the lip. Complete and Incomplete: This describes whether or not the cleft goes all the way up into the nose or not. Want a second opinion? If you’ve had an antenatal diagnosis of cleft lip you may be able to get a free or discounted 3D/4D scan to see your baby in more detail. Sometimes a cleft lip is not picked up at any scans before birth and can be a big surprise to parents. This is especially likely to happen (30% of cases) if the baby has a cleft lip without a cleft palate. A cleft palate by itself (called an ‘isolated cleft palate’) is almost impossible to pick up before birth through regular scans, and can be easily missed when a baby is born if it is not looked for. Midwives and other health professionals should visually examine the baby’s mouth with a torch by pressing down on the baby’s tongue so the whole of the mouth can be seen. Find out more about how a cleft palate is diagnosed. National Standards state that a cleft palate should be diagnosed within 24 hours of birth, but over 30% are diagnosed later. Find other parents who received a late diagnosis using the Parent Interest search. 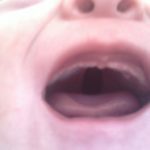 Some cleft palates are clearly visible, especially when they involve the hard palate (the bit at the front of the mouth towards the teeth) as well as the soft palate (the bit at the back of the throat). Sometimes babies are born with a ‘submucous cleft palate’, which means there is a cleft in the muscles but it is covered by the lining at the top of the mouth, so it can’t usually been seen by the naked eye but can still have an impact on feeding, speech and hearing. With cleft lip and palate, the majority of babies (91%) are diagnosed with a cleft lip before birth, so most parents have a chance to learn more about cleft and prepare for the possibility that their child will have a cleft palate as well. However for some parents, this isn’t the case, and the birth of their child may be the first time they’ve ever heard of the condition. 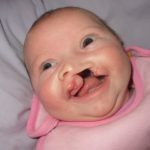 Your baby will need an operation to repair the cleft. 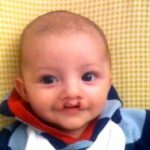 A cleft lip is usually repaired within the first 3-6 months of a baby’s life. A cleft palate is usually repaired within 6-12 months of birth. If there is a gap in your baby’s gums, this will be repaired as his or her adult teeth are coming through with an Alveolar Bone Graft (ABG) operation at around 8-12 years old. The timing of treatment will be discussed with you by the cleft team. It may be necessary for your child to receive follow-up treatment later on as they grow up. Find out more about cleft surgery. All of your baby’s treatment will be managed by your local NHS Cleft Team, which is made up of health professionals who all specialise in cleft lip and palate. There is a 20-year treatment pathway in place, but how much care your child need will depend on the type of cleft they have and how it affects them as they grow up. Your Cleft Nurse Specialist will be in touch shortly after diagnosis and/or birth and will be a point of contact for you in your child’s early months if you have any questions or concerns. 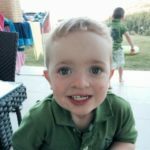 “If your little one is diagnosed with cleft, then our first and most emphatic bit of advice is don’t over-Google. 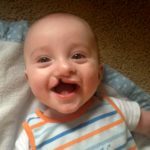 There are a number of clinical conditions that can be associated with cleft but which won’t necessarily apply to your child. If you Google too much before you’ve seen an expert doctor, you are highly likely to terrify yourself. The most important step once the diagnosis has been confirmed is to be put in touch with one of the NHS Cleft Teams around the UK. These are based in hospital units which specialise in the treatment of cleft lip and palate. No referral? Parents may not be given a referral straight away, or it may be delayed. If you are still pregnant, it could be that your obstetric unit wants you to wait for days or even weeks to have a second ultrasound scan. However, if you’ve received a diagnosis of cleft, you should be put in touch with the Cleft Team straight away, and they will aim to contact you within 24 hours. It can be helpful if you have the details of your Cleft Team handy to help with the referral. If you’re having real problems getting a referral, you can try calling the Cleft Team directly to ask for their advice. Once a referral has been made by your obstetrician or midwife, someone from the team should make contact with you and arrange to see you, usually one of the Cleft Nurse Specialists. If your baby has already been born, you should be visited in the hospital by someone from the Cleft Team and shown how to manage any issues your baby may have with feeding, etc. If you are still pregnant, you may be invited to meet other members of the Cleft Team at the hospital nearer the time your baby is due. Never be afraid to ask questions of the Cleft Team – they are there to help you! It may help if you keep a list of questions as they come up and take these with you to any meetings. Always keep a record of names, dates and any other useful information you receive, as this can be helpful as your child grows up. Many parents of babies born with the condition find it helpful and comforting to talk to someone who has experience of a child with a cleft. CLAPA’s Parent Supporters are on hand if you want someone to talk to. Get in touch today to be matched up with someone in the same area and/or with the same sorts of experiences as you. Your Cleft Nurse Specialist or a CLAPA Parent Supporter will be able to answer any questions you have, or at least point you in the direction of someone who can help. You may also want to join our Facebook Group for parents which has over 8,000 members and counting. Visit our ‘Dealing with Diagnosis’ page to find out more about support from the CLAPA Community. If you have received an antenatal diagnosis of cleft lip, you may be able to have a free 3/4D ultrasound scan at one of several centres around the UK. These scans are more detailed than a regular ultrasound and will let you see your baby’s face in more detail. How do I tell friends and family members? Will I have to change my birth plan? What do I need to buy before my child is born? Source(s): Range of existing literature from CLAPA, including a leaflet produced by the Royal College of Surgeons in association with CLAPA. Information from a number of Cleft Teams has been consulted to give an overview of treatment. Stories and suggestions from our community have been included throughout. This information has been reviewed by cleft health professionals as well as members of CLAPA’s community.